I'm trying to make a local website using OS X Server (4.0.3), and am following the tutorial that comes with Server. When I use Safari on another Mac, when I try to go to the website (myserver.local) the website doesn't load/is stuck 1/3 of the way loading. Open the Server app to see the list of services available in OS X Server. Select Websites. This is the name that Safari users on your local network use to view the website. Select the server’s local network IP address from the pop-up menu. 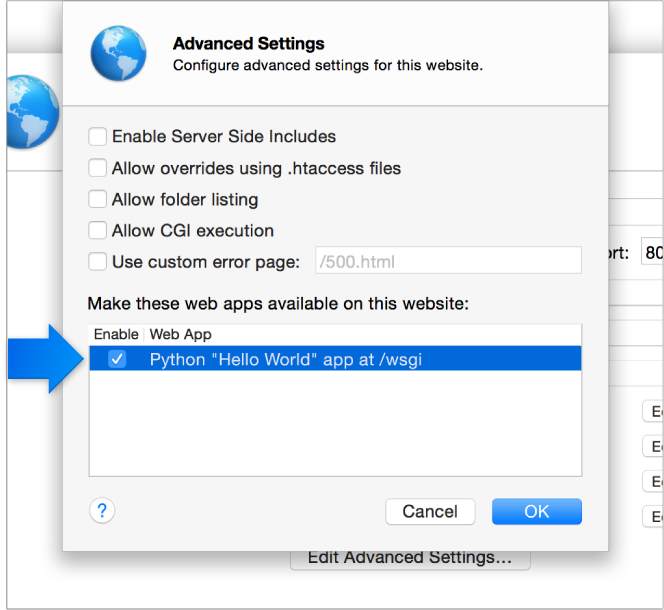 Click Edit Advanced Settings, then select “Python ‘Hello World’ app at /wsgi.” Then click OK. Note: Once you get this working, you could add your own web apps written in Python. Return to the website creation pane, and click Edit next to Index Files. Add an index called “/wsgi” and drag it to the top of the list, then click OK.
After the configuration is finished, click Create to make the new site. 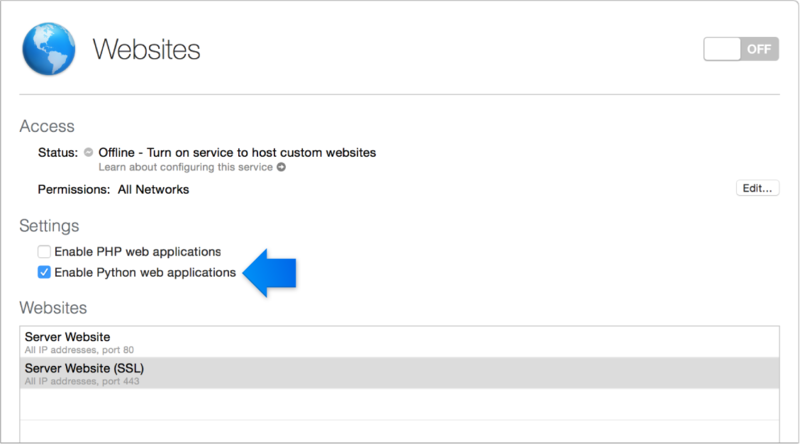 Open Safari and go to the site URL (myserver.local, in this lesson) to see the generated page. However, the test is failing with Safari stuck 1/3 of the way loading by looking at the progress in the address/search field. How can I figure out what's wrong with my server and/or setup? Here's how I'd troubleshoot things using terminal. You can use the console app as well to look at logs, but the serveradmin commands are more detailed than the server app allows currently and historically. curl localhost - this tests that port 80 is listening and a web server is running. Once you've narrowed down if the problem is running apache and basic networking/DNS to get localhost to work or if there are problems with the code/content you can take next steps. Also, looking over the tutorial/lesson - it looks like the selection was on HTTPS and not HTTP, so go back and ensure you are using https://myserver.local and https://localhost or http:// throughout and the server app is configuring the port (80 for http and 443 for https). For simplicity, I've just used port 80 for this answer and my server setup. Not the answer you're looking for? Browse other questions tagged yosemite osx-server websites .